The turkey I roasted this Thanksgiving was my best one yet. I think what happened was, I was in a hurry. 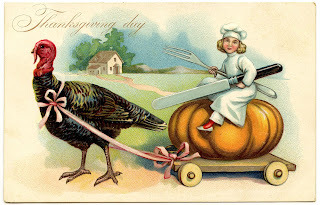 My Thanksgiving this year was totally mismanaged. First I went out every night for the week before the big day. Every night. And in the mornings before work, I worked on the book. Ergo, recipe for disaster. I went to the Sportsmen's on Wednesday to hear Tom Russell because it was my brother George's birthday. And later, at midnight, there I am, making pie crusts. Then I soared like an eagle -- well, like an owl is more like it -- and threw together this, ahem, Pear Cranberry Pie With Oatmeal Streusel. After that I was excited about what I had accomplished so it took me forever to get to sleep. So next day, Thanksgiving morning, I continued taking on water. I rolled out of bed and barely made it to church, almost running over a couple of Turkey Trotters. At church I breathed a prayer of thanks for mantillas. They cover the bedhead. Now here is where things really went off the rails. After Mass I just hang around the church gossiping and joking around. As if I did not have to cook dinner for 15 people! La la la la la la la. I got home and could not believe how late it was. It was noon and I had not even made the stuffing. I had not even removed the turkey's plastic Tops packaging. Never have I been in this bad shape by noon on Thanksgiving Day. Never. So, end result as we say here in Buffalo, that turkey, a 22-pound big boy, went in the oven for four hours at 425 degrees. That is the secret! I found it on this chart and hoped for the best. And it came out great! I am thinking, the hotter temp is the way to go. It was so browned and yummy. Next year I want to do it the same way. But without the panic, you know? I do not need another panicked Thanksgiving!